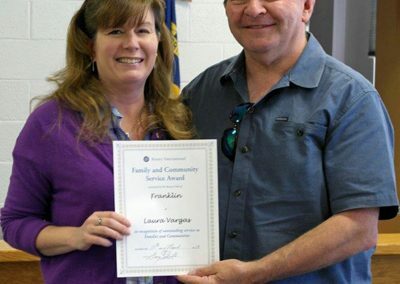 The Community Care Clinic of Franklin provides free medical services to residents who are uninsured and who do not qualify for government assistance programs. The Clinic is staffed by volunteers from the medical community and the community at large, and operates “after hours” at the Macon County Health Department two days a week. 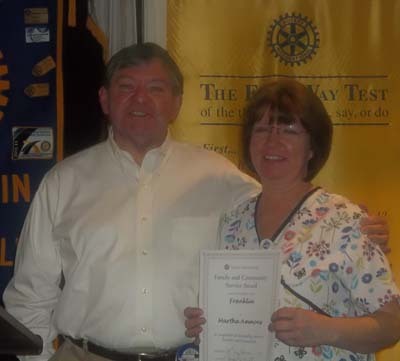 The Rotary Club of Franklin has an ongoing relationship with the Clinic, having supported it with both volunteers and cash donations. 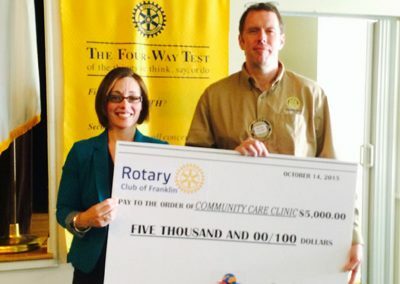 In 2015-16 the club applied for a District Simplified Grant and donated $2,500 to the Clinic. In order to obtain grants in continuing to support the clinic going forward, the club will need to take a more hands on approach. If you have questions about the Community Care Clinic or would like to get involved, please contact Community Service Director for 2017-18 Patrick Bettencourt. 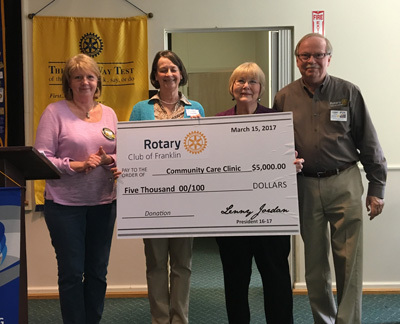 The Rotary Club of Franklin presented the Community Care Clinic $5000 on March 22, 2017. 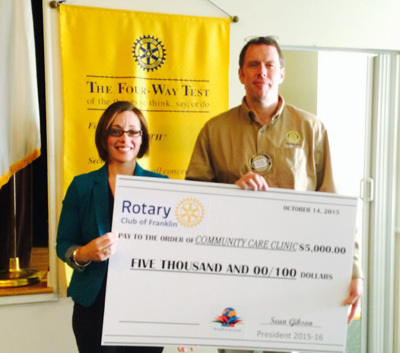 Club President 2015-16 Sean Gibson presents clinic director Kim Losee a check for $5,000 on October 14, 2015. 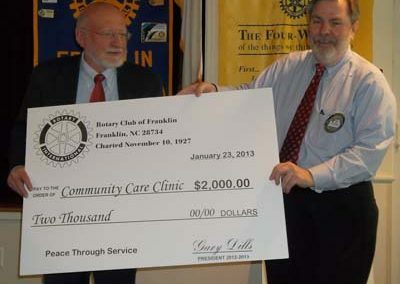 Community Care Clinic of Franklin Director Franklin Ingram (L) receives a check in the amount of $2000 from Rotary Club of Franklin Community Service Director 2012-13 Vic Perry. 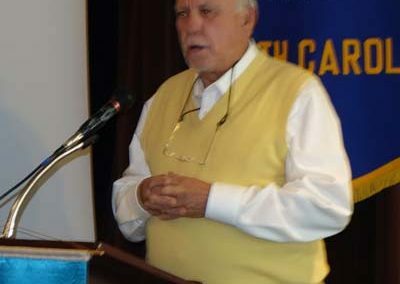 The club contributes each year to the clinic which provides health care service to those that do not have insurance and cannot qualify for government assistance. The presentation was made at the January 23rd, 2013 meeting. 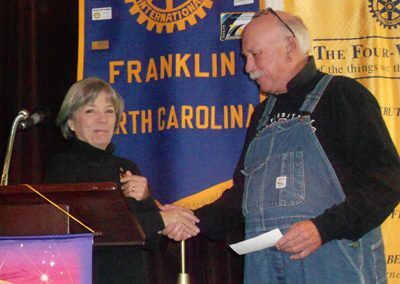 Vic Perry (L) community service director of the Rotary Club of Franklin presents a check from the club in the amount of $2,000 to Sallie Tallent, representative from Community Care Clinic for their work in the community. 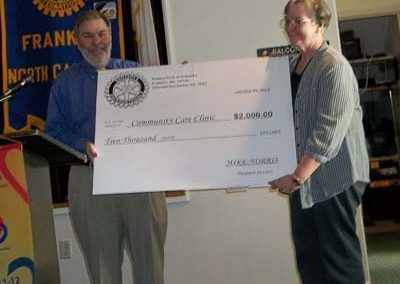 The check was presented at the January 25th, 2012 meeting. 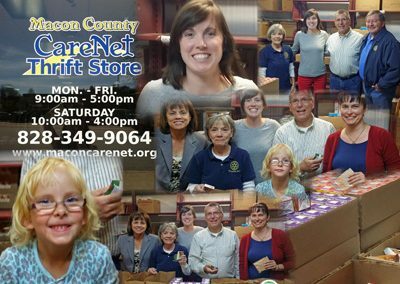 The club has partnered with the Macon County Care Network for several years. CareNet provides food and assistance for community residents for whom other resources, including government assistance, are not available. In the past, the club has supported CareNet financially and through “Fill the Bag”(read more about it by moving cursor to “Service Projects”…then “Community Service”…then “Fill The Bag”). Recently the club has partnered with CareNet to fill backpacks once a month for needy individuals in the community. Anyone who has questions about the club’s partnership with CareNet, or who would like to be involved may contact Community Service Chair Patrick Bettencourt. Several Rotarians helped fill 388 backpacks full of food for the needy at CareNet on October 27th, 2014. 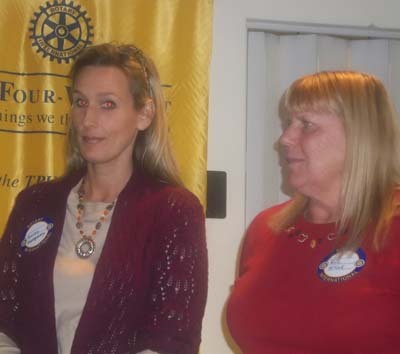 Great work Rotarians! 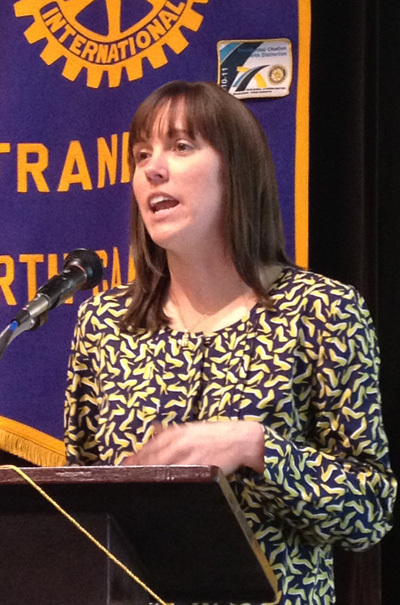 Shaina Adkins, Executive Director of Macon County CareNet spoke to members of the Rotary Club of Franklin April 16th about her organization’ s efforts in the community to help the needy. 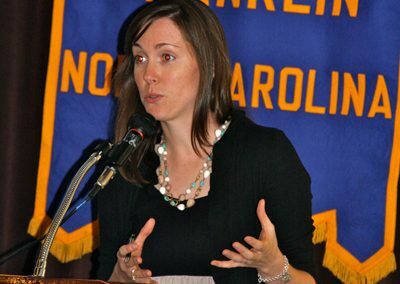 Shaina Adkins, Executive Director of Macon County CareNet spoke to members of the Rotary Club of Franklin August 15th, 2012 about the organizations efforts in serving the community. 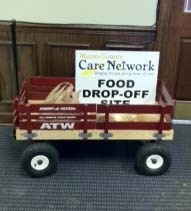 Care Net has helped over 670 familes year to date and has distributed over 100 thousand pounds of food to needy familes while taking in over 50 thousand pounds of donated food. Care net is in need of personal hygene donations from the community to provide for needy families. 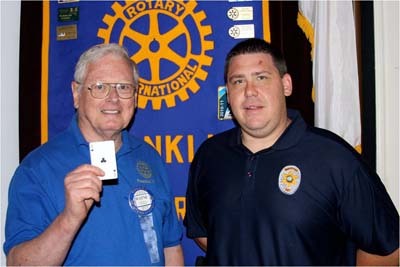 The Franklin Rotary Club has been a proud supporter of the Shop With A Cop program for a number of years. This is a program initiated by one of our own, Sheriff Robert Holland. 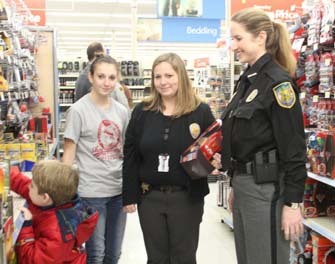 Each year children who might not otherwise get to experience the joys of the Christmas season are identified, and are taken shopping by local law enforcement officers with funds donated by the community. After shopping, the kids are treated to lunch at a local restaurant. This project has brought smiles to the faces of hundreds of children at Christmas, and The Franklin Rotary Club has and will continue to lend support. For more information on the Shop with a Cop Program see Rotarians Robert Holland and Community service chair for 2017-18 Patrick Bettencourt. 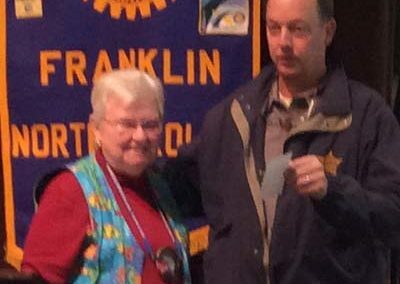 Rotary Club of Franklin 2013-14 President Nancie Wilson presents Macon County Sheriff and club member Robbie Holland a check for $1500 for the Shop with a Cop Program on December 11th, 2013. 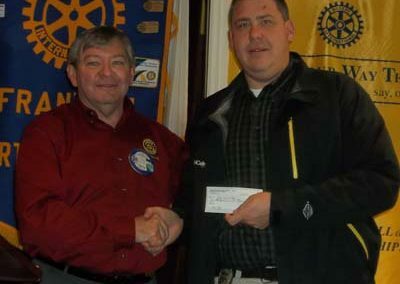 Rotary Club of Franklin President Gary Dills (L) presents Lt. Tony Corbin (R) of the MCSO a check for $1000 for the Shop with a Cop Program. ( Below) Rotarian and REACH of Macon County’s Ann Van Harlingen is presented with additional gift cards from Corbin with the Shop with a Cop program. 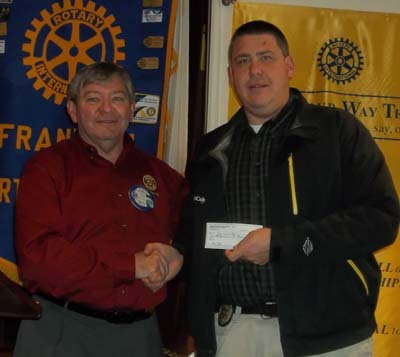 Rotarian Cliff Harris (L) presents fellow-Rotarian and Macon County Sheriff Robert L. Holland with the rest of the donations that helped make the 20-11 Shop with a Cop a huge success. 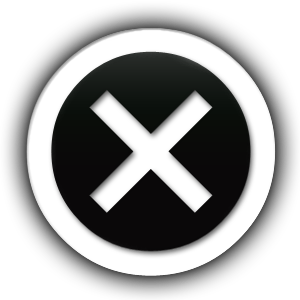 The presentation was made December 14th, 2011. Rotarian Wayne Swank (L) draws the winning 50/50 card from Lt. Tony Corbin of the Macon County Sheriff’s Office and donates his $302 to Shop with a Cop at the July 13th, 2011 meeting. 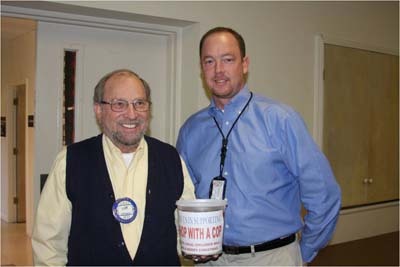 Rotary Club of Franklin’s Tom Coley ( R ) drew the winning card in the club’s 50/50 raffle winning $314 on November 9th, 2011. 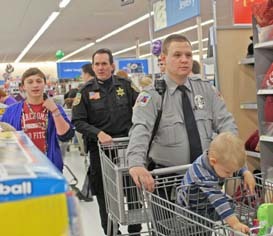 Then without batting an eye, he turned around and gave it all to Shop with a Cop. Way to go, Tom! 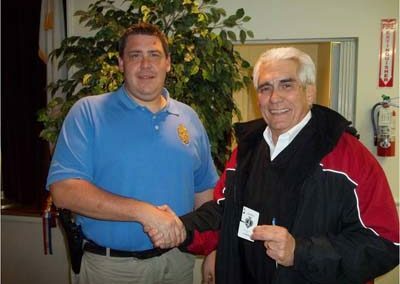 Lt. Tony Corbin of the Macon County’ Sheriff’s Office ( L) conducted the drawing. 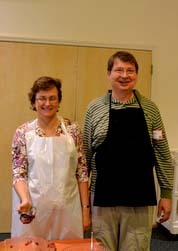 Each year, the First Presbyterian Church serves dinner to the local community on Thanksgiving Day, with turkey and dressing and all the trimmings. 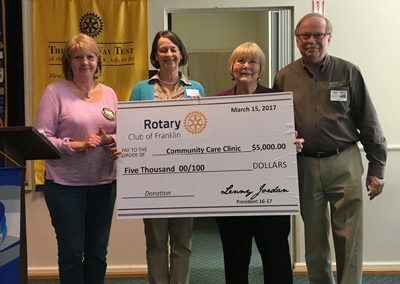 The Rotary Club of Franklin has donated to this effort for several years, and club members have given of their holiday time to help serve the guests. 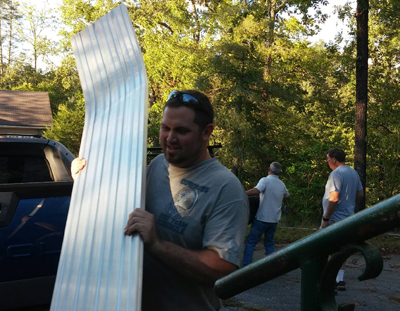 The Church does a great job with this project every year, but volunteers to help serve are always appreciated. This is a great way to give a little back to the community! If you are interested in helping out, please contact Community Service Chair Patrick Bettencourt. 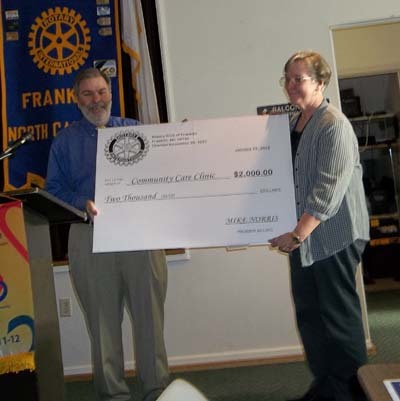 First Presbyterian Church of Franklin was presented a contribution from the club for the community thanksgiving dinner in November 2016. 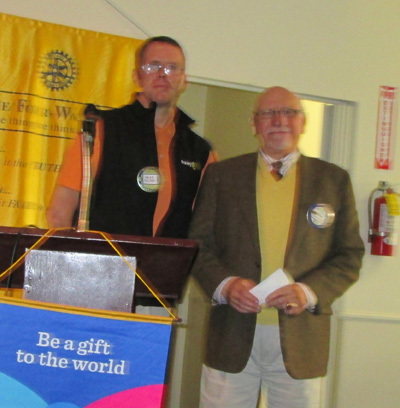 Club President 2015-16 Sean Gibson presents First Presbyterian’s John Duncan a check for $600 for the thanksgiving meal November 11th, 2015. 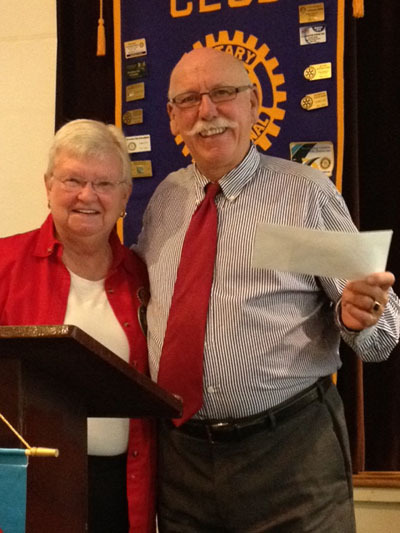 First Presbyterian’s John Duncan receives a check for $500 from the club for the upcoming Thanksgiving Dinner on November 12th, 2014. 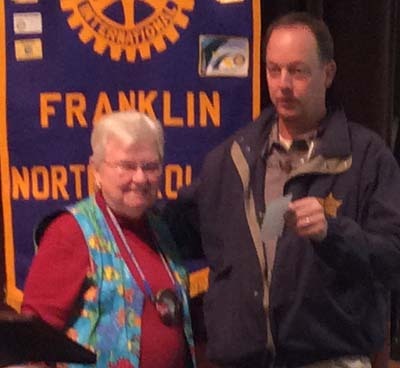 Rotary Club of franklin Presidnet Nancie Wilson presents John Duncan (R) of First Presbyterian Church of Franklin $500 for the community thanksgiving dinner project. 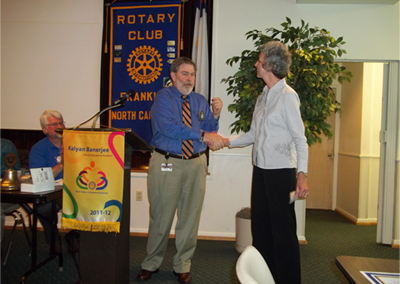 The presentation was made October 16th, 2013. 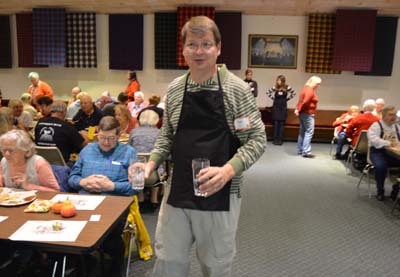 Rotary Club of Franklin’s Tom Harris volunteering at the 2012 Thanksgiving Dinner at Tartan Hall. 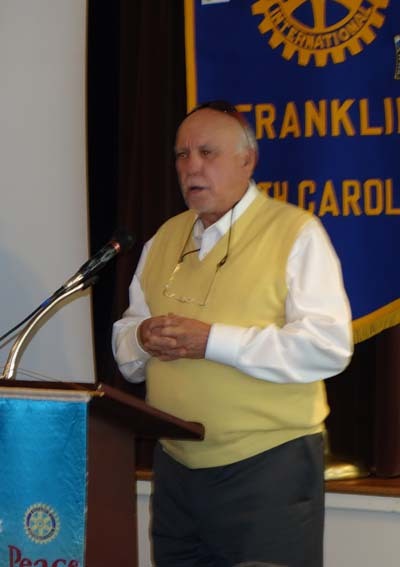 John Duncan, Elder with First Presbyterian Church in Franklin spoke to members of the Rotary Club of Franklin in October 2012 thanking them for their contniued support of the ThanksgivingMeal and encouraged those to continue help with the efforts as the meal has grown each year. 2012-13 Community Service Director Vic Perry (L) presents First Presbyterian Church’s Patsy Clinton a check for $500 for the Community Thanksgiving Meal on October 26th, 2011. Rotary Club of Franklin’s Tom Harris in the kitchen at First Presbyterian Church in Franklin. 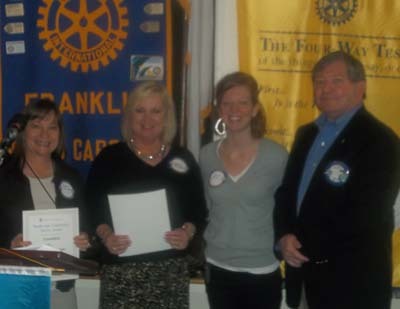 In the past, the Rotary Club of Franklin has supported CareNet financially and through “Fill the Bag”, a project that asks community residents to donate pantry items by filling a grocery bag that is distributed with an issue of The Franklin Press during the Thanksgiving season. 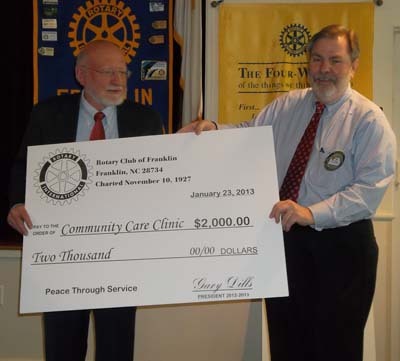 Our club partners with the Franklin Daybreak Rotary Club and The Franklin Press on this project. Anyone who has questions about this club’s project partnership with CareNet, or who would like to be involved may contact Community Service Director Patrick Bettencourt. A “Fill the Bag” drop off site at the Macon Bank Holly Springs Branch. Kid’s Place is a non profit agency founded in 1991 by concerned community members wanting to improve services for abused and neglected children in Macon County. The organization does not house the children but provides a home-like environment with trained professionals specialized in interviewing children on reports of abuse. Professionals also perform medical exams and provide counseling. Kid’s Place does not charge for counseling and other services. Kid’s Place does bill Medicaid when possible. 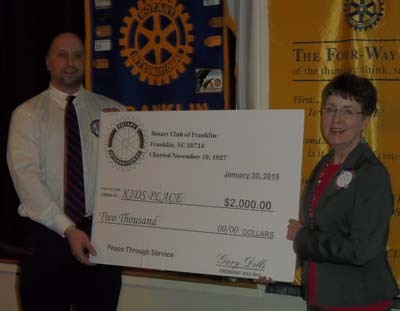 In 2012-13 The Rotary Club of Franklin was able to help Kid’s Place financially with a $2000 donation to help meet its goal of $20,000 to get a matching grant. 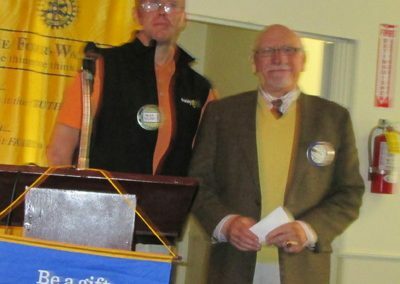 A Rotary District 7670 matching grant was part of the contribution. This more than satisfied the requirements for the organization to obtain the matching grant from the Robert and Polly Dunn Foundation. 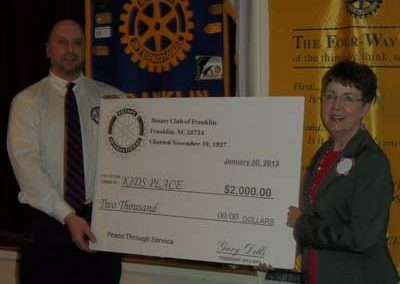 Rotary Club of Franklin Kid’s Place Club Champion John Henning (L) presents Alisa Ashe (R) of Kid’s Place a check for $2000 on January 30th, 2013 from the Rotary Club of Franklin. The club alone, was able to generate $1500 to support Kid’s place from member contributions. 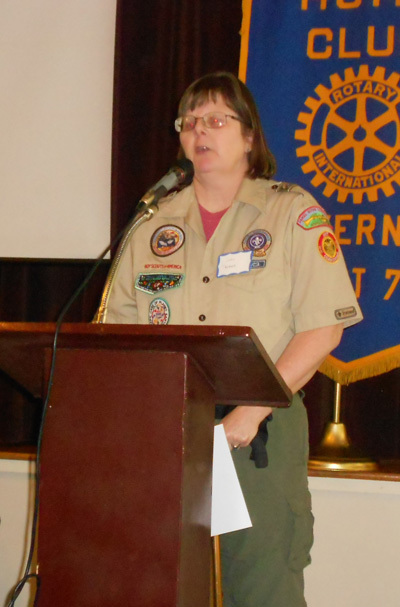 The Rotary Club of Franklin has had a long relationship in supporting Boy Scout Troop 202 here in Franklin. 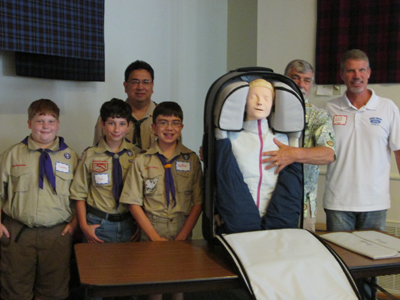 Recently the club helped the troop re-organize again with financial and service support. 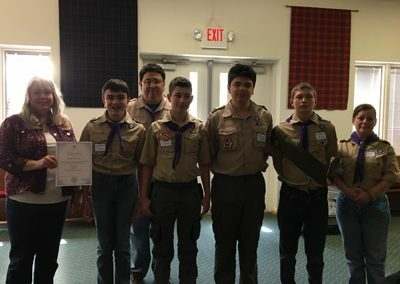 The troop received a matching donation of $1000 from the club in 2013-14 and the troop is conducting fundraisers in the community to continue its operation. 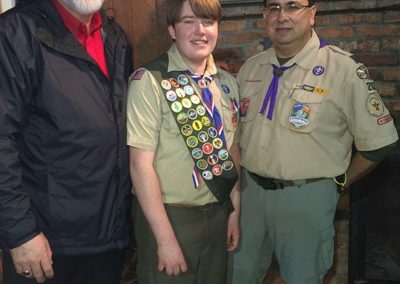 Charlie Vargas is the 202 troop master. Volunteers are always needed. 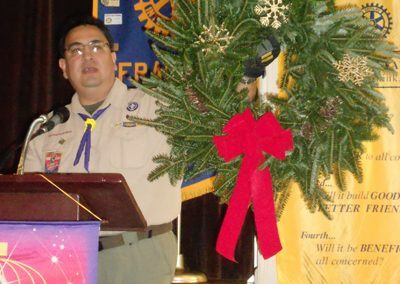 For more information on Troop 202 see club liaison Mike Norris. Club PE Judy Chapman and members of the Troop 202 April 12th, 2017. 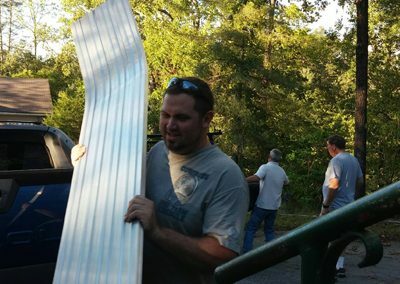 Club members helped the troop move items from storage to the Slagle Building on September 29, 2016. 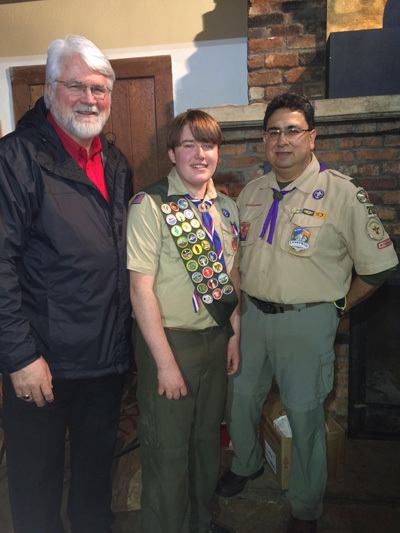 Caleb Watson honored as Eagle Scout in February 2016. 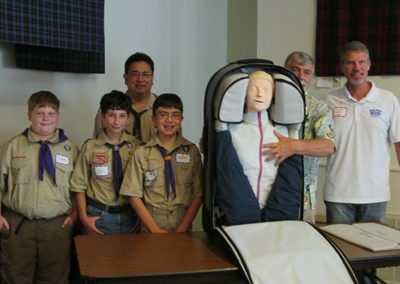 Larry Hinton (far right) of the Rotary Club of Sylva and Andy Shaw Ford presents the Boy Scout Troop 202 a new resuscitation mannequin to be used by both local troops at the August 19th, 2015 meeting. 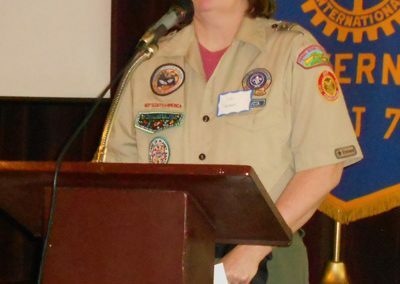 Lucy Thorne with the Daniel Boone Council officially renews the troop’s charter on April 8th, 2015. 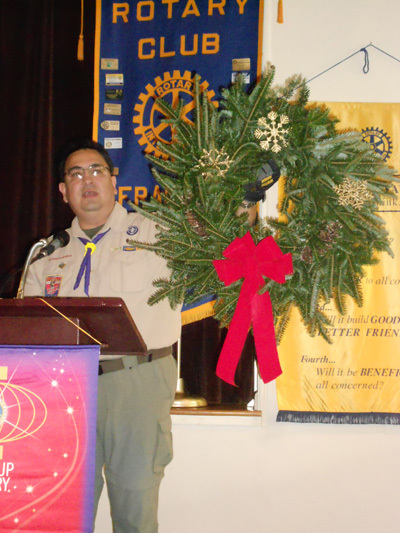 Troop master Charlie Vargas spoke to members of the club in November 2014 about the troop’s wreath fundraiser. John Henning, Sr. (C) is recognized with a Rotary Service award in March 2014 for his longtime work with Troop 202. 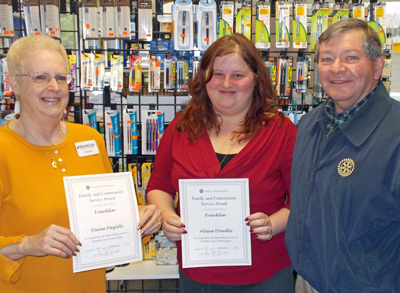 The Family and Community Service Award was established during the 2012-13 Rotary year and recognizes those individuals that volunteer their time, goods, and or services to help the club’s efforts in serving the Franklin and Macon County communities. 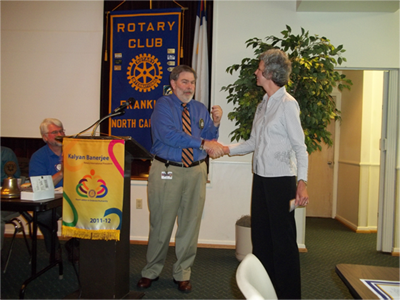 The award is presented randomly throughout each Rotary year. 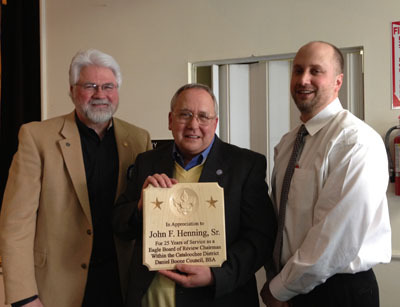 For more information on the Family and Community Service Awards see Community Service director Patrick Bettencourt. 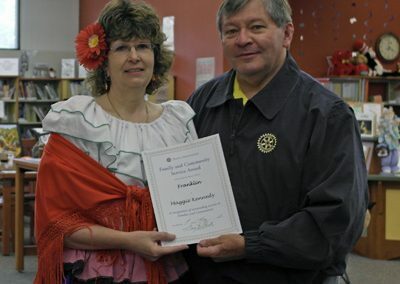 Maggie Kennedy (L) receives the Rotary Club of Franklin’s Family and Community Service Award’ for her continual support of Read2Me programs for youth. Maggie has been a mainstay of Read2Me particularly with the younger readers. 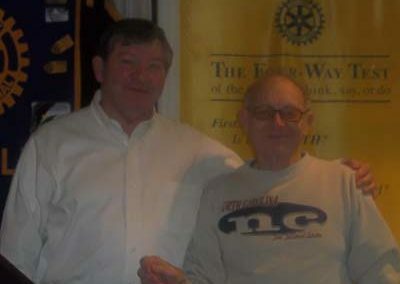 The award was presented May 2, 2013 by 2012-13 club president Gary Dills (R). 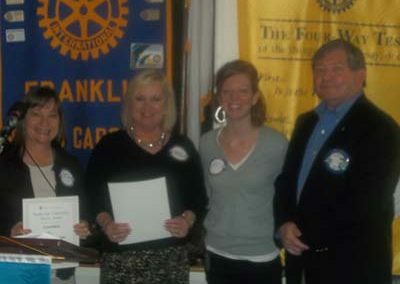 The Rotary Club of Franklin saluted (L to R) Carol Waldroop, Diane Cotton, Maria Tallent and Brittney Parker with a Family and Community Service Award for their efforts with the Read2Me project. 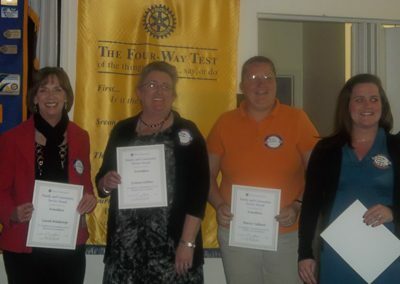 The awards were presented at the March 13th, 2013 meeting. Martha Keener (L), Kathy Breedlove (2nd from left) and Maura Morris are presented with the club’s Family and Community Service Award. The award recognizes their efforts in helping the club with the Roy Rickman Scholarship and youth programs. 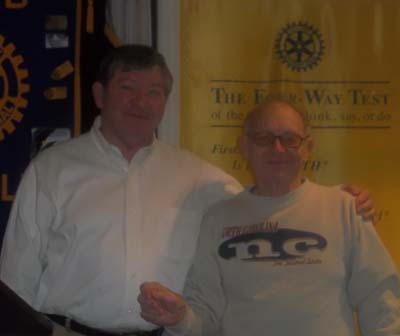 The presentation was made at the February 27th, 2013 meeting by club president Gary Dills (R). 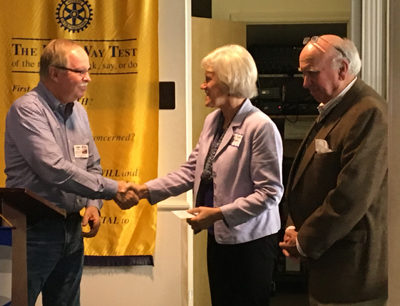 Rotary Club of Franklin President Gary Dills (L) presents First Presbyterian Church’s Kenny Limlie (R) a Rotary Club of Franklin Family and Community Award for his help in setting up the club meetings each week at Tartan Hall. 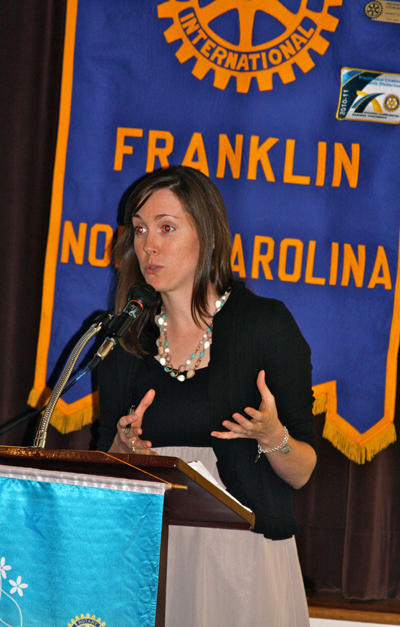 The presentation was made at the February 20th, 2013 meeting. 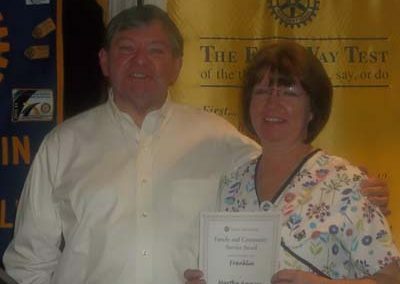 Martha Ammons (R) of Angel Hospital was recognized with a Rotary Club of Franklin Family and Community service Award on February 20th, 2013. 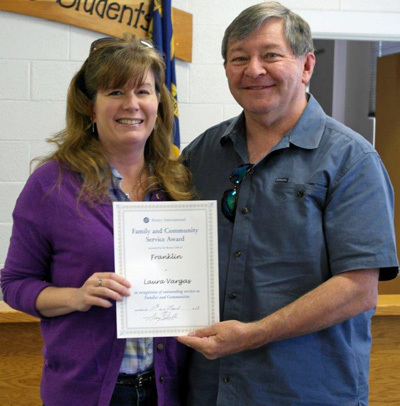 Ammons was honored for her work with preparing the weekly meals for the club’s meetings. 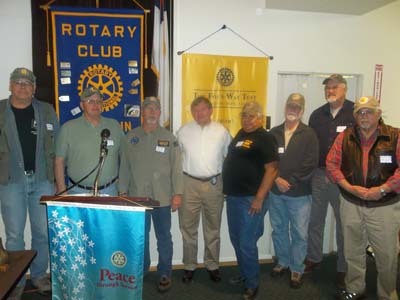 The Rotary Club of Franklin honored the Vietnam Veterans of America local chapter 994 for all of their service at the February 20th, 2013 meeting. The veterans were saluted with a Rotary Club of Franklin Family and Community Service Award. 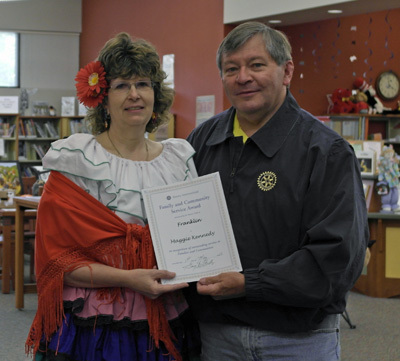 Laura Vargas (L) is presented with a Family and Community Service Award for her work with the club’s Read2Me project here in Macon County. 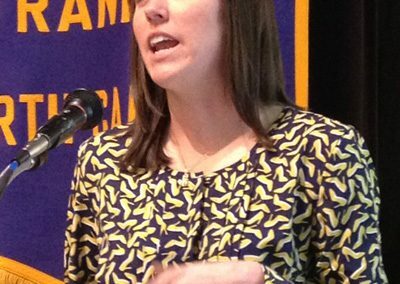 The presentation was made in April, 2013. 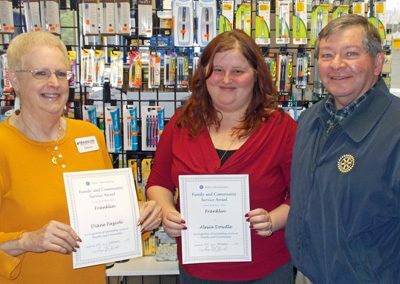 Becky Montgomery (L) and Rebecca McCall (R) of Cartoogechaye Elementary School were recognized as Family and Community Service Award recipients at the February 13th, 2013 meeting. 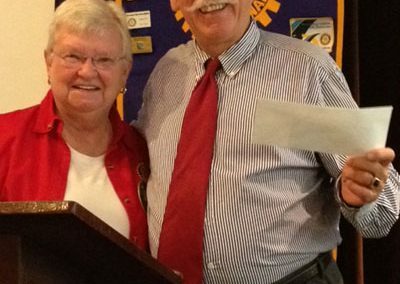 The Rotary Club of Franklin recognizes those individuals for their dedicated service in helping the club serve the community. On September 30th, 2015 a group of 6-8 Rotarians and 35-40 Franklin High School FFA students gleaned almost a ton of produce in about two hours from Mitchell Farms in Macon County. 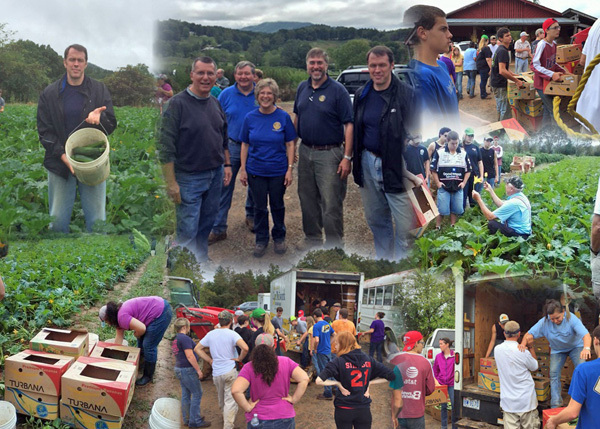 The gleaned produce along with additional donated produce totaled around two tons. This was the first year of the project and thanks to all who participated. 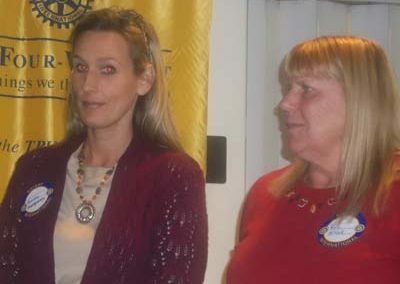 The project was lead by chair Janet Greene. Great work! The club hopes to do it again.